* Tapstorm now provides a temporary +1 Auto Tapper (+2 when Energized) for its duratio(from a flat +10 TPS). * Activating a skill while idle will no longer break idle, except for Clickstorm taps. * Golden Taps will not benefit from idle gold. * Energized skills now have a pink glow. * Activating a skill while it is still active will now extend the energized state in addition to resetting the duration. Massive 2.5.0 Update! * Significant game rebalance with a new zone scaling mechanics* New Outsiders* New Heroes* Quality of life improvements* Various bug fixes* And more! - Significant game rebalance- Clickmas Returns! Hey Heroes,This is an early warning for patch 1.0e10. It will be arriving in several days, and will have a lot of changes!If you’ve transcended ever, the game will require you to transcend upon loading into the 1.0e10 update! Google Play sign-ins are now re-enabled. Log into Google Play via the options menu in order to restore your game if you lost it. - GooglePlay sign-ins are disabled while we work on a critical crash issue. Cloud saving is also disabled since it relies on GooglePlay game services, so reinstalling or uninstalling the game will cause you to lose your progress. - Saves can now be exported/imported through the Options menu. (Note: You will not be able to transfer between mobile and PC. 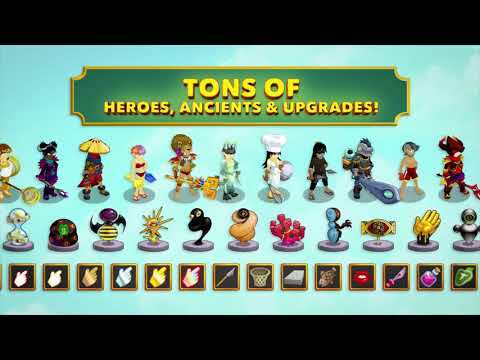 )- There is now a toggle on the Ancients panel that allows you to buy Ancient levels by value.- Auto Tappers can now be placed on the Buy All Upgrades button.- Boxy & Bloop Auto Tapper appearance!- Random Auto Tapper appearance option which selects a randomly owned appearance whenever an Auto Tapper is placed.- Patch notes can now be viewed through the Options menu.